Biomass pellet, made from waste wood, corn stalk, straw, cassava stalk, sawdust etc. made into pieces, compressed and dried is already widely used all over the world. It has been used as fuel or heaters in industries such as thermal power plant etc. Biomass pellets reduce CO2 (Carbon Dioxide) emissions and enter into the environment as friendly energy. Not only are pellets cheaper than other heating costs, but they are also better for the environment. Our biomass pellet mills are used to compress wood (solid wood, tree trimmings, wood chips, sawdust, straw, bark and shavings) with no additives, make high density quality pellet with same size. The advantage of ZLSP R-Type pellet mill is to produce the wood pellet without any binder, and it only needs one time pressing. 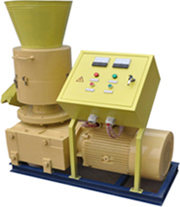 It is the ideal pellet mill to process sawdust and hard materials, because its working efficiency is higher. This kind of biomass pellet mills are also used to compress agro wastes materials withouta binder, such as sawdust, peanut shell etc, its working efficiency to process hard wood is a little lower than ZLSP R-Type series pellet mills. As we describe above, ZLSP R-Type series pellet mills can produce quality wood pellets at one time pressing from hard wood and soft wood, but ZLSP D-Type pellet mills need 2-3 times pressing if you use them to process hard wood. Notice the difference. 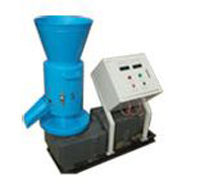 The advantage of ZLSP D-Type small pellet mill is with little cost, easy operation etc.